‘Tis the season of togetherness. And in that spirit, we had something fun in mind. What if instead of buying separate timepieces for under the tree, you invested in one you could share? Today, unisex watches are more abundant than ever. With the continuing trend of vintage timepieces for men and women reaching for larger, mechanical watches, it’s never been easier to meet in the middle. Here are just a few of our favorites that you can pull out of the stocking together. The Datejust is a watch you can match with your significant other. Want in on a secret? 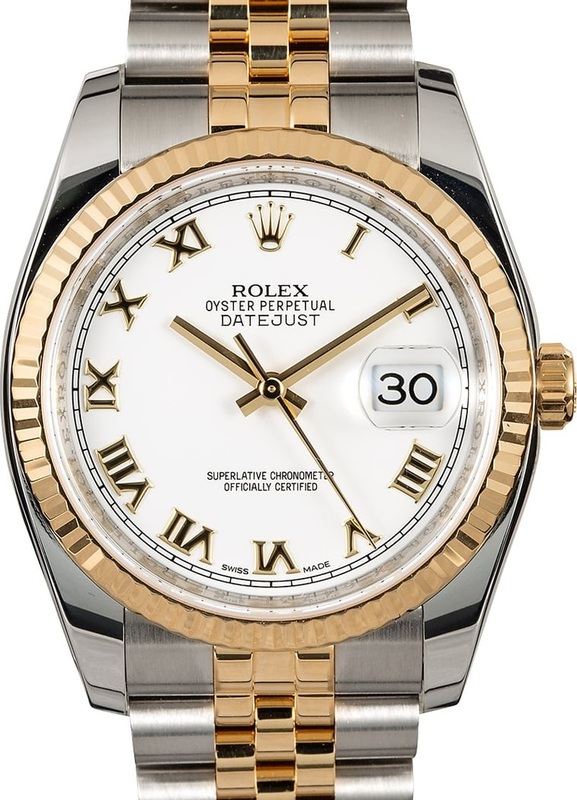 You can’t really go wrong with a Rolex Datejust 116233. These watches are, and always will be, classic. This one here featuring a two-toned stainless steel and 18k yellow gold frame and bracelet is an excellent example of timeless elegance. The white dial with gold Roman numerals are also inherently sophisticated — making this watch all around beautiful and totally unisex. This 36mm Datejust is going to look just as good on his wrist on the golf course as her wrist on date night — the stainless steel and gold duo making it easy to dress up or down and only adding to the sheer versatility of this timepiece. Not only will you be able to enjoy this watch throughout the years, but it’ll last a lifetime, too. The automatic 3135 movement is safely secured by a waterproof screw-down crown and protected by a scratch-resistant sapphire crystal. To be honest, there’s not really a better versatile, everyday, unisex watch out there. There’s speed-racing red, apple red and burgundy — and then there’s the brilliant crimson featured in the Hermes Cape Cod. 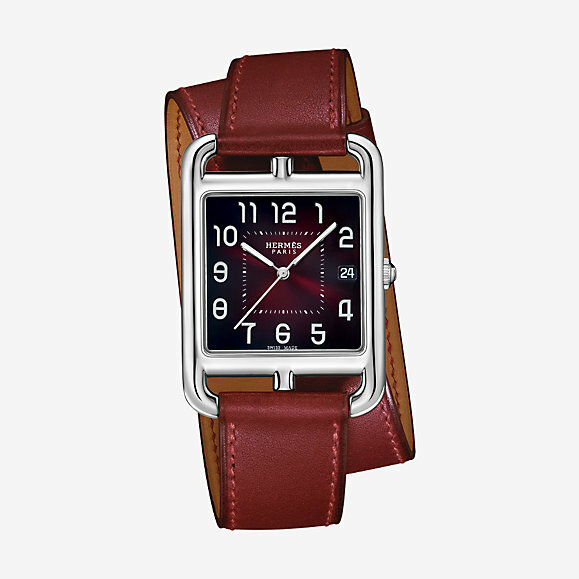 This square watch is iconically built inside a rectangular frame, giving it totally unique look topped off with an equally unique bracelet — the brand’s famous double tour strap in matching color. It just oozes with holiday charm, doesn’t it? The best part is that the shape, color, and size make it totally unisex — although, if one or both of you find the double-bracelet a bit too feminine, you can always swap it out for one of the brand’s many other leather bands. Hermes is such a stylistically classic brand, but what we love about the beautiful and ‘very large’ 33x33mm Cape Cod frame is that it adds just enough modernity alongside that expected classicism. When you get past that beautiful steel frame, your eye is drawn to that graduated crimson face accented by those raised numerals — their font inspired by the sailor Chaîne d’ancre motif. The only downside of this watch is that it’s a quartz — you can get this watch with an automatic movement, but it just doesn’t come in this amazing red we adore for the holidays. 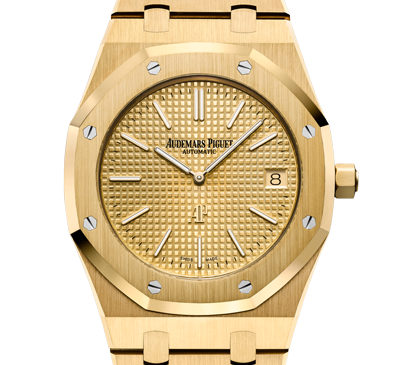 A little sporty and totally eye catching — this glimmering all-gold Royal Oak by Audemars Piguet is an institutional classic that still manages to feel totally unexpected. The unique octagonal case with those big screws and bold bracelet are guaranteed conversation starters — making this the perfect watch for the couple who likes to make an entrance. But while loving this watch will be easy, sharing it won’t. You’re both going to fight over the yellow-gold toned dial with “Petite Tapisserie” pattern, matching applied hour-markers and classic Royal Oak hands with luminescent coating. The 39mm size will fit his wrist perfectly and sit on her wrist with just the right amount of pomp she craves. The gold case and bracelet don’t make it the most durable, but this watch can withstand 50m water resistance and the automatic, self-winding Calibre 2121 makes it an easy piece to wear daily.